I wanted to take a break from the excerpts from the modes book I’ve been posting and post a lesson that’s based on material from my new Harmonic Combinatorics Book. In that book, I have an entire section about using triads and 7th chords to create more complex sounds. Playing a minor chord (or arpeggio) a 1/2 step below a major triad implies a Lydian sound by giving you upper chord tensions (7, 9, #11) of that major chord. (i.e. B minor/C). Playing a minor chord (or arpeggio) a step above a minor triad implies a Dorian sound by giving you the upper chord tensions (9, 11, 13) of the minor chord. (i.e. playing B minor over A minor). Lowering the 3rd a 1/2 step gives you a 9th. Since there’s no other 3rd in the chord – this becomes a slash chord of G Major over C (written G/C). It has a lot of the sound of a major 9th chord – but because it’s missing the 3rd it really only implies the tonality. If you want this to sound like a Major 9th, we’ll need to add a 3rd in as well. Lowering the 5th a 1/2 step gives us the #4 (aka the # 11). Here I’ve kept the 3rd to make it a Major 9 (#11) chord. So, as a short cut, playing a B minor over C we imply the sound of a C major 9 (#11) chord without having to memorize a separate voicing. When I see voicings that use the middle notes of the 7th fret, I generally try to think of ways to incorporate harmonics into it. In this example, I’ve added harmonics in to fill out a B minor arpeggio with some encircling to resolve it to C. I forgot the fermata on the first chord – but you’ll figure it out when you hear the mp3. Now we’ll take this in a different direction: playing B minor over A minor implies a cool A minor 13 sound. I’ve added an A to lick #1, and a semi-chromatic run that skips the 3rd and makes it a more open sound. I’ve resolved the lines to the root notes of the chords I’m playing over – but you may want to stay on a tension depending on the context. With any approach like this – always use your ears as a guide for what sounds good and what doesn’t. Did you notice anything about the C major voicings? Using a B minor triad doesn’t take it to the 13th. In any chord tone voicing, raising the 5th a step gives you the 6th (if no 7th is in the chord) or (in this case) the 13th So using our initial voicings, the easiest way to bring in the 13th is to raise the G on the high E string to A. 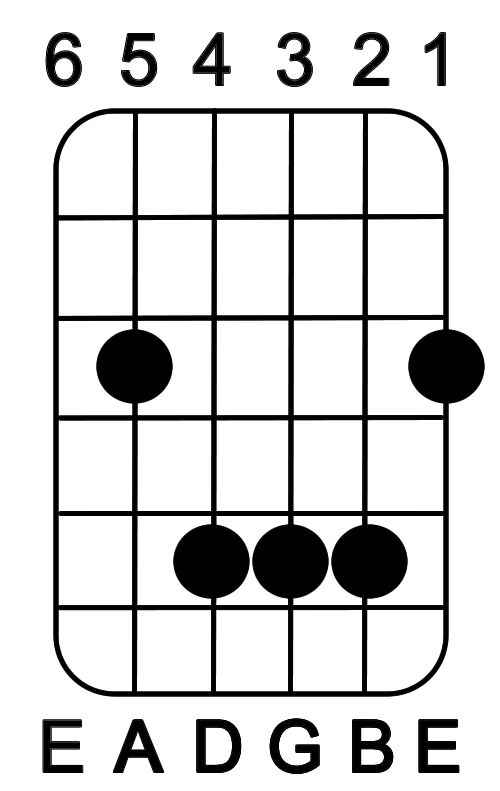 Playing a minor chord (or arpeggio) a 1/2 step below a major triad implies a Lydian sound by giving you upper chord tensions (7, 9 and #11) of that major chord. (i.e. B minor/C). 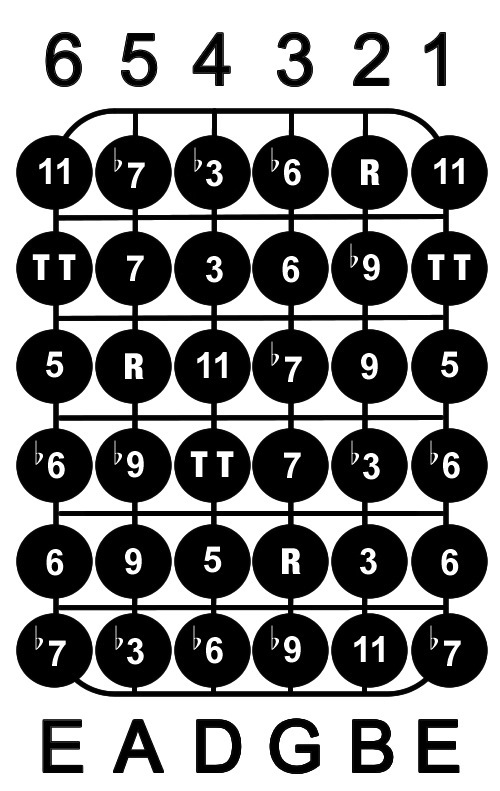 Playing a major chord (or arpeggio) a step above a major triad also implies a Lydian sound by giving you the upper chord tensions (9, #11 and 13) of the minor chord. (i.e. playing D/C). As with any material here, pay attention to the 3 T’s (Timing, (hand) Tension and Tone) and just go through the lesson at your own pace and return to it as you need to. This entry was posted in Applied Theory, Lessons and tagged Applied Theory, Chord Substitution, Chord Superimposition, Chord voicings, Deciphering Scales, fretboard visualization, Guitar Mode Lesson, Guitar Performance, Guitar theory, Guitarchitecture, Guitarchitecture Books, major scale lesson, making sense of modes, modal use, Online Guitar Lesson, Scott Collins, Scott Collins Guitar, Slash Chords, sonic visualization, Triad Transformation by GuitArchitecture. Bookmark the permalink.